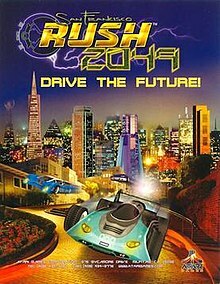 San Francisco Rush 2049 is a racing video game developed by Atari Games and published by Midway Games for the arcade, Nintendo 64, Game Boy Color, and Dreamcast. It was released on September 7, 2000 in North America and November 17, 2000 in Europe. It is the third game in the Rush series and the sequel to San Francisco Rush: Extreme Racing and Rush 2: Extreme Racing USA. It is also the last game in the Rush series to be set in the city of San Francisco, and the last one to be released on a Nintendo console. The Dreamcast version was later re-released as part of Midway Arcade Treasures 3 for the PlayStation 2, Xbox, and GameCube. The game features an arcade-style physics engine. Race tracks are based around a futuristic representation of San Francisco. Cars have the ability to extend wings from their lateral aspects, allowing for mid-air adjustments. This feature is a product of the science fiction setting and as such is not seen in other entries in the Rush series. As with previous titles in the franchise, Rush 2049 features a stunt mode in which the player scores points for complex mid-air maneuvers and successful landings. The game also includes a multiplayer deathmatch battle mode and race mode for up to four players. There are six race tracks, four stunt arenas, eight battle arenas and one unlockable obstacle course named 'The Gauntlet'. Different Automobiles and Automobile components are unlockable throughout the progression of the game, but cheat codes can allow for the instant achievement of these components. The single player race mode places emphasis on outlandish and death-defying shortcuts, creating a risk and reward structure to the gameplay. The game's soundtrack mostly comprises Big beat, Breakbeat and Drum and bass. The arcade version was an eight-player game (but more commonly bought in pairs), sit-down machine with force feedback steering wheels, gear shifts, and three pedals (gas, brake, and clutch). A telephone-like keypad to the right of the steering wheel gave players the option of choosing a PIN and allowed them to earn points to unlock new cars and tracks. The machine used a 3dfx Voodoo 3 graphics card. The original San Francisco Rush 2049 was released in 1999. This version features a roster of five playable tracks and eight different cars, with more unlocked as the player progresses through the game. In each stage the player must race seven other CPU-controlled cars. The racetracks contain a total of 100 coins which when found unlock new cars and paint jobs. In 2000, Midway released an upgraded version, Tournament Edition, that fixed bugs and added new tracks and cars. It also had the ability to connect to an external server, via a T1 network connection, and play against other players in an online tournament. The upgrade was recalled soon after as Midway shut down its online tournament network, although it may still be found in a few sites that retained it such as Video Bobs Starbase Arcade in San Rafael which was heavily involved in play-testing as a result of their proximity to the Midway West campus. In 2003, Betson Enterprises released an upgrade, called San Francisco Rush 2049 Special Edition, that added two new tracks, ten new cars, and new shortcuts. This game was the final game released to carry the Atari Games moniker prior to the company being renamed Midway Games West later that year; with the Special Edition version release being the final Midway arcade game altogether, released two years after Midway shut down their arcade division and just before Midway Games West shut down that same year. Rush 2049's soundtrack mostly comprises genres of big beat, break beat, drum and bass, and techno. All Arcade songs were composed and produced by Mike Henry. While Barry Leitch composed and produced for the Nintendo 64 and Dreamcast versions which have almost entirely unique soundtracks. The N64 version contains twelve music tracks, almost all of which are exclusive to that version and do not feature in the arcade versions. The Dreamcast version includes twenty music tracks, many of which are the same as the arcade versions and some of which are exclusive to that version. The arcade version includes eight music tracks, six of which are used during gameplay. San Francisco Rush 2049 was ported to the Nintendo 64 and the Sega Dreamcast in 2000 by Midway Games. The Nintendo 64 and Sega Dreamcast versions, as in the original arcade version, contain Dickies and Slim Jim advertisements. When released under licence as Midway Arcade Treasures 3, the Slim Jim advertisements were removed and replaced with Midway Games logos. All console ports featured a variation from the arcade version, that being the addition of stunt wings. The arcade version did not feature the stunt wing ability, which allowed player to perform maneuvers in the air whilst gliding. San Francisco Rush 2049 was also ported to the Game Boy Color by Handheld Games and published by Midway Games. The tracks differ from the other versions whilst the cars are identical. The racing takes place from a top-down perspective. Midway Games had plans to create a double pack for Hydro Thunder and San Francisco Rush 2049 under the name Hydro Rush for the Sony PlayStation 2, but the game was canceled, when the project moved to Midway Arcade Treasures 3. ^ "Hydro Rush". IGN. Retrieved September 27, 2012.